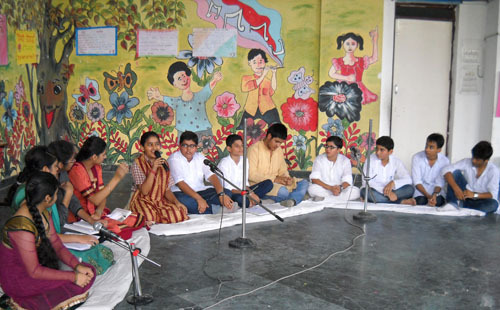 Dated: 25th Oct., 2012: Primary students of Jodhamal Public School organized a special assembly on 25th October to mark the celebration of Dushehra in the school campus, which included narration of mythological tales in the form of "RAMLILA". 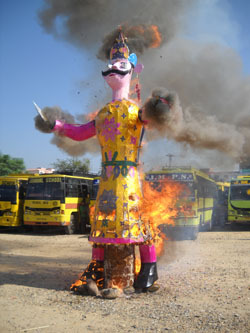 The highlights of symbolic Ravanana's effigy were ten faces of Ravana enactment and the symbolic burning of effigy of RAVANA depicting ten evils of the present times e.g. Terrorism, corruption, drug addiction, poverty, child labour, deforestation, pollution etc showing the triumph of good over evil. 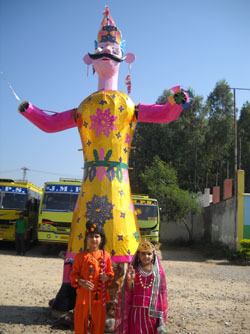 It also made children learn about Indian mythology and importance of the festival. 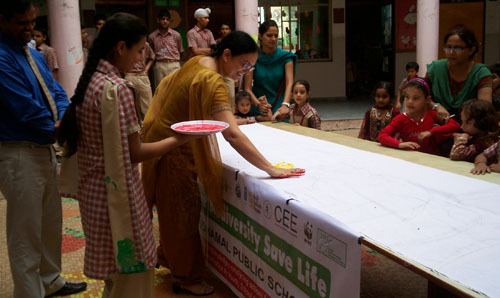 The students were then addressed by the Principal and CCA coordinators Ms. Ranju Malhotra highlighted the significance of this festival and addressed to the students to fight for the eradication of evils of the present times. Head boy and Head girl Abhayjeet Kala and Sankasha Sharma made the occasion more meaningful through the interesting facts they shared with the whole school abut Dushehra. 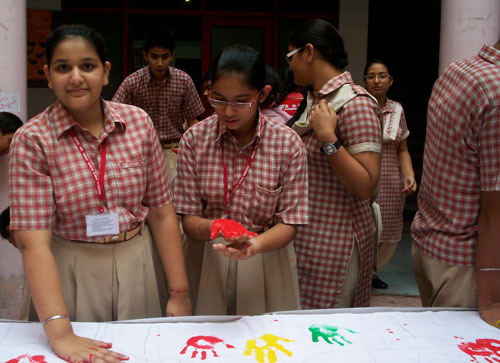 Lively programme was presented by students and even staff members of senior wing, in which they presented many Kavi-Samallen highlighting the importance of Hindi in our life. Young toddler made this occasion more a success by presenting a beautiful dance drama which highlighted the changing face of Hindi. 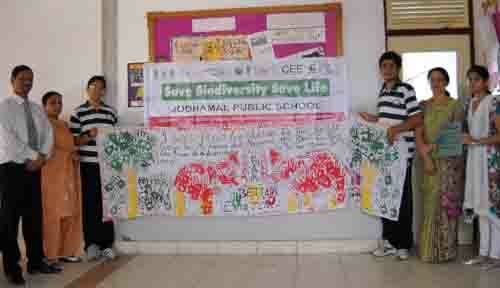 The young debates of classes IV and V stole the heart of gatherings by their great speaking skill. Throughout the weeks students tried to create a platform on how the spoken Hindi, combine with activity make Hindi our national language. They conveyed a message on Hindi Devata day saying it is an important occasion to come together on a common platform to discuss the way Hindi is bring influenced, used and promoted. Mr. Harmeet Kukkal HOD Hindi and here team comprising of Ms. Leelawati Bist, Ms. Manpreet, Ms. Shallu Sharma, Ms Ruby Sharma, Ms. Anju Jamwal, Ms. Anju Raj, Ms. Anita Gupta and Ms. Neerja Puri appreciated the efforts of their students and gave body as token of love. Principal Mr. Trilok Singh Bist also spoke on the occasion. Principal Mr. Trilok Singh Bist and Vice Principal Ms. Rohini Aima appreciated the efforts of Hindi Department to make this occasion a grand success. Vote of thanks was presented by Vice-Principal Ma’am who thanked students and teachers for taking up such a creative and inspiring step in promotion of our national language.